It’s a phrase uttered in football circles almost constantly, and one which angers people at the same time. Can a football team really ever be too good to go down? Wayne Barton’s coverage of a period of Manchester United’s history is an almost melancholy look back at a time when the club’s fortunes were suddenly in free-fall. After 24 years of success under Sir Matt Busby, who retired in 1969, United entered a period of decline, something which nobody thought could happen so quickly. In 1968 they were the champions of Europe, and just six years later they were relegated to the second division. What Barton does with Too Good To Go Down is explore the factors around the failing of Busby’s successors. Whereas other football historians might mention results and league positions, here we have theory as to why the club weren’t ready for change. The part of the book about Wilf McGuinness, who was chosen by Busby to take over from him, highlights how he never really had full control. And why Frank O’Farrell who succeeded him was never the right man for the job. But Barton digs deeper than this. The elements that were in the background that the author explains and stitches together nicely makes for the most intriguing read. When you read or watch something from this era, you often get a candid, raw honesty with it. And Too Good To Go Down is full of that kind of emotive writing. It’s a book that’s immensely well written. 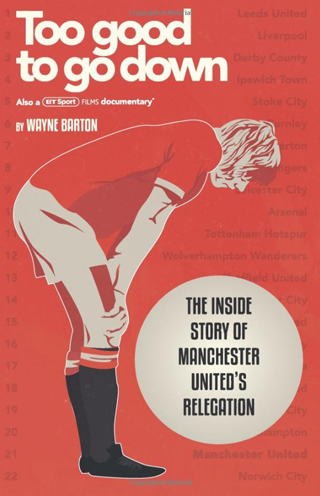 I’ve read a number of Wayne Barton’s Manchester United books and I’ve enjoyed all his work. He often concentrates his writing on certain periods of time that aren’t necessarily successful, but are important to supporters of the club – so this story is a no-brainer for a writer of Barton’s ilk. The book is lavished with in-depth disclosures from some of the players and legends from that time, like Gordon Hill, Lou Macari and Alex Stepney. There’s also huge input from manager Tommy Docherty, the guy who did take United down but at the same time re-galvanised the club in to playing a winning, entertaining brand of football. But although ‘The Doc’ was great as a Manchester United manager, you could question him as a man. Although he made important decisions for the good of the club, some of the player accounts of how he handled those decisions leave a bad taste in the mouth. Too Good To Go Down isn’t just an analysis of what went wrong, though. There’s a romantic attachment to this period for United fans, where despite dropping down a division the crowds were still the highest in the country. Home and away. The book embodies this throughout the pages, and as you read you’re able to build a picture in your mind. It lets supporters like me, who wasn’t even born then, to immerse themselves in to what following Manchester United was like during those times. And after relegation, the attacking and entertaining football made a welcome return too. That season is fondly remembered by fans, and Too Good To Go Down highlights the positives of the 74-75 season superbly. Barton’s detail and entertaining style is consistent throughout. He’s written another fantastic book to add to his shelf of sporting classics. BT Sport Films have already worked in collaboration with him to produce a documentary to go with the book. And as much as that is a must-watch, Too Good To Go Down is a must-read.